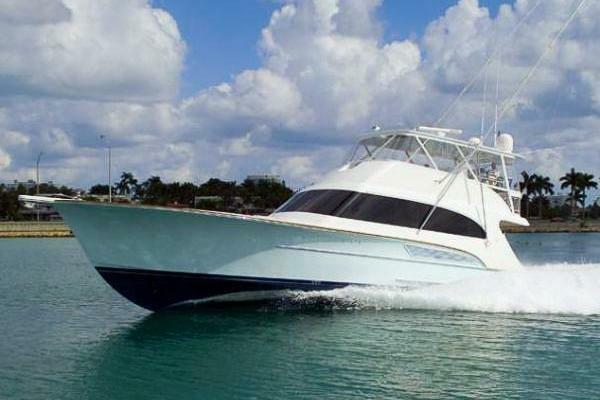 United Yacht Sales New Jersey would love to guide you through a personal showing of this 62' Ocean Yachts Super Sport 2002. 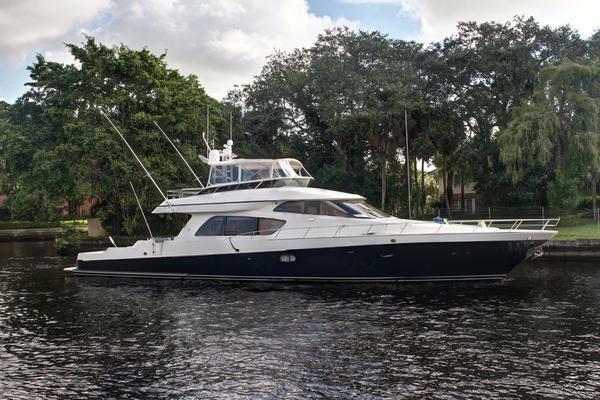 This yacht for sale is located in St. Thomas, USVI, Florida and priced at $529,500. For a showing please contact us by filling out the form on this page and we will get back to you shortly! Forward from the large fish-fighting cockpit, one enters the spacious Salon. Features of the salon include new carpeting throughout, a large "L" shaped settee aft on the port side with a spiral staircase just forward which leads up to the enclosed fly-bridge. Upgraded silhouette blinds add elegance to the main salon and beautifully fit and finished teak paneling and cabinets run the length of the starboard side and an entertainment center is housed all the way forward. "Sea Dance" features the Galley-up interior layout with a dinette just up one step and forward of the salon. Forward and down from the galley/dinette is the accommodations deck which features three (3) double staterooms and three (3) heads. This layout features a laundry center, king-size bed in the master's cabin, queen-size berth in the VIP and twin/single berths in the second guest's stateroom. An Enclosed Fly-bridge is accessed via a spiral staircase leading up from the Salon. This area is air-conditioned and provides a quiet, dry and comfortable ride for owners and guests. Features of this area include a center-line helm station, dual Pompanette Prestige model pedestal mounted helm chairs, L-shaped settee and wet bar with ice-maker. Generators (2) - Westerbeke 15 KW each w/ 3400 hours each Electric oil changing system for main engines and generators. 8 - GelCel 12/24 volt batteries (new 2016) Glendinning Cablemaster - (2) shore-power reel retrieval & storage systems Shore Power 50 Amp. cords (2) Battery Charger - Sentry 24V-40Amp Dyna-Plate grounding system Watermaker - Village Marine 600 GPD Air-Conditioning - 5-zone Cruiseair Bow Thruster - Vetus Glendinning Engine controls Trolling Valves Fireboy engine room fire suppression system Emergency bilge pump valve system enabling using the main engines. Teak cockpit with teal cockpit coaming boards, custom spreader lights, (6) GG Schmitt trolling rod holders and freshwater shower and sink. Insulated cockpit fishbox chiller Fresh and saltwater washdowns - cockpit Cockpit table & 4 adjustable dining chairs Rupp Outriggers with double gold spreaders and tips Underwater transom lighting (3) Live-bait well w/ circulation pump Bow Pulpit w/ anchor roller and rail USCG safety package Lewmar concept III windlass w/ 200'of chain rode FBG swim platform with boarding ladder Davit - QuickLift 1000 Lb. capacity 2010 model Novurania 430D RIBtender w/ 60 HP Yamaha 4-stroke outboard engine is available as an option (price $12,000.00) A Bluewater fish fighting chair (not aboard) may be made available by the owners for additional purchase (price $6,000.00). Trac Vision G6 Satellite TV system w/ flat screen TV in the salon and 3 receivers, Bose speakers and surround sound. TV's w/ built-in VHS, radios and CD players in each stateroom. Novurania Tender Air-Compressor Diving Equipment Owner's personal effects and property.